This photo was taken on July 5, 2018 at 11:39 AM. The location was in City Center, near the Convention Center in Washington DC. The "Take It!" came from my having looked at this setting for almost a week as it is located near where I park on a regular basis while doing my part time job. The configuration of the bicycle wheel, the bike lock, and the stout bike rack almost have a posed look to them. 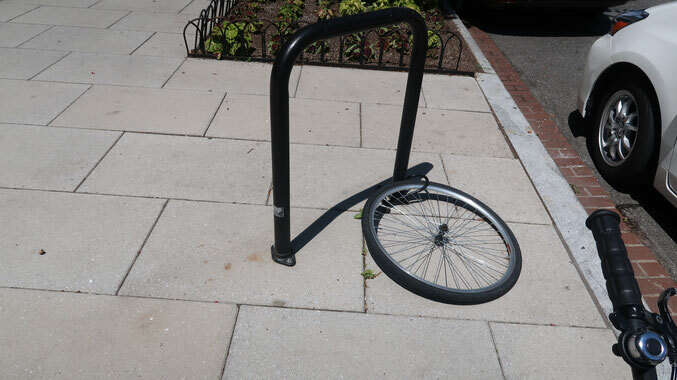 I suppose it could be an art form, but is really a basic warning to make certain to capture not only the front wheel but it in addition to the back wheel and the frame when one is locking up their bike. I hope the person who owned this bike has learned their lesson and will do things differently in the future. Now the game will be to see how long it takes for the city to send a maintenance crew out to remove the lock and the wheel. We are into week number two since I discovered this readily available lesson in bicycle security. Even though it takes more time to lock up a bike properly - it is worth the effort. The After Take: I have shown this photo to several folks who in spite of how stark it is - all liked it. It was mainly for the "can’t miss composition" and the lesson conveyed. Poor guy, I'd be pretty pissed. Awww, how sad. I guess it really would be a warning for future people not to leave their bikes locked like this. I had a bike stolen one time, its pretty frustrating. I wonder if the city just left it there as a warning, lol.